With the coming of Rampage of the Beast King, the Pale Moon circus is seeing an expansion on their established play, simultaneously bolstering their existing Crimson Beast Tamer style while also integrating new cards to further develop the format. This comes at a time when many feel that the circus has fallen out of a competitive scene that it was struggling to be sustainable in to begin with, and so the rain of new material is well welcome by Pale Moon cardfighters. Addressing the past weaknesses of Hades Ringmaster is Girl Who Crossed the Gap and Innocent Magician, both of which move to the rearguard when ridden over. Innocent comes from the same line as Shizuku and Acorn Master, and he shares their shortcomings. Innocent's counterblast 1 to search for a grade 3 is too costly in a Pale Moon deck for what it does, as that counterblast will be needed for soul swap skills, and is most useful at a point in the game when retire-based units have already hit the field. Even at that late stage, the accuracy is in question in a deck that tends to quickly shave random cards off the deck and into the soul. Girl Who Crossed the Gap meanwhile, uses the same cost to soulcharge herself and superior call another Pale Moon from the soul. This places all the way of early-game soulcharging on Skull Juggler, but makes up for this by giving the Pale Moon cardfighter direct, unstoppable card advantage and being a repeatable skill that can be brought out once more with cards like Purple Trapezist. By making careful use of Gap, Manager's job can also be done for him, superior calling the Juggler that was ridden at the start of the game multiple times with Trapezist and other soul-swap skills. For triggers, there's no direct advantage to using Funny Pierrot vs Popcorn Boy. Poison Juggler takes precedence over Dynamite Juggler due to his +3000 power move-to-soul skill, and Rainbow Magician similarly has a place above Flyer Flyer and Spiral Master because of his soulcharge skill. As I said last time, Pale Moon's access to multiple types of draw triggers was intended to supplement the lack of card advantage generated by Hades Ringmaster. Since BT07 and Girl Who Crossed the Gap removes the triggers from this context, they now generate additional cards rather than compensate for a lack of them. 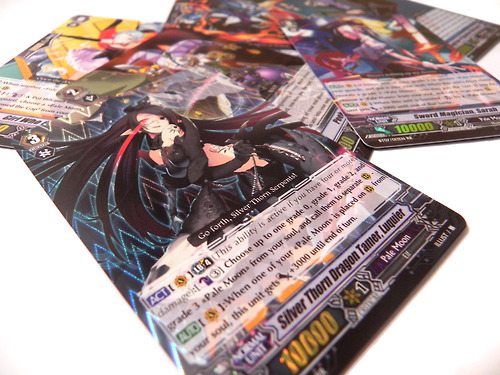 However, because Sky High Walker is the clan's only guaranteed means of unflipping the damage needed for Alice and Bunny's Deadly Shadow Beast, almost all Pale Moon decks will need to run some strand triggers. This does work in their favor, since to begin with one of the clan's most prided features is its fourth and fifth attacks, which jump up to six and seven with a checked stand. Bull's Eye, Mia cannot be recommend over Skull Juggler, because she gives the opponent room to stop the soulcharge, and Juggler's skill is easy to repeat with Gap. So like Starting Presenter, Mia can't really challenge Juggler as the king of soulcharging. Dreamy Ammonite exists as a counter to the long-loathed Berserk Dragon, Kimnara and Amon, along with other retire-based units. Unique in that it only preserves advantage on the opponent's turn, when Ammonite is retired an additional Ammonite can be called from the soul. Because the soul is public knowledge, the opponent is unlikely to deliberately retire an Ammonite. Amon is the lone unit that this skill would see popular use against. Soul swap itself has evolved considerably since BT03. To recap the old maneuver, originally you would superior call Trapezist with Bunny, then soulcharge the unit Bunny had boosted to bring out Alice, Cerberus or another attacker that Trapezist could boost. Alice furthers the combo, potentially superior calling Bunny to start the chain all over again, but all this is limited by the opponent's ability to guard, by your damage zone and by your soul's contents. Magician of Quantum Mechanics is BT07's answer to Bunny and Trapezist. His cost is identical to Bunny, but it activates in the main phase, before you attack. After soulcharging himself, Quantum can then call any Pale Moon unit other than Magician of Quantum Mechanics. Completely unstoppable, the skill falls short of achieving the same rapid attack ability since it goes off in the main phase, but does resolve many of the issues surrounding Bunny to bring out on-soul skills--at a price. Magician's call is not perfect. The unit he calls will return to the soul in the end phase, and Quantum would return to the field. If however, Magician's target is Alice or Bunny, and their skill activates, Magician's skill will not resolve and play can be resumed as normal. Rampage also modifies Pale Moon's power-gain formula. While initially Turquoise Beast Tamer was presented in Demonic Lord Invasion, gaining +3000 power when her sister Crimson was in the soul (and this is intended to combo with Crimson for a 20000-power column), Jumping Glenn effectively replaces her in that role. When Glenn is superior called from the soul, she also gains +3000 power--but unlike Turquoise, this is over a 7000-power base. Pale Moon's wide range of call units, including the newly-introduced Quantum, makes Glenn's conditions very easy to fulfill, replacing Turquoise for the foreseeable future. Cycling Actor is an interesting card. A classic Claire, Cycling gives +2000 power to another Pale Moon when he's called; unlike similar cards from other clans however, Cycling can be reused by swapping him in and out of the soul with other cards, potentially repeating his skill several times with the likes of Quantum, Gap and Alice/Bunny, building up the strength of weaker rearguard columns to make for a strong overall offense. The reason that I stress the rearguard for Cycling is that Rampage of the Beast King brings with definitively stronger vanguard units over past sets. Silver Thorn Dragon Tamer, Luquier has gotten the most attention of these--the first skill you tend to see from her is an autoskill, giving her +3000 power for each soul-based superior call of your Pale Moon rearguards. With Quantum calling Glenn that's an immediate 23000-power column for dealing with the 11-13000 power vanguards dominant in the coming format, sufficient to catch any fighter's eye. And the well-loved Alice/Bunny-Trapezist formula can pump Luqui up to 16000 in the battle phase, ready to reach the same numbers with basic boosting units, or as far as 25000-31000 with two formula columns working in concert. Beyond that though, Luquier's limit break 4 is a heavy counterblast 3 to superior call up to one Pale Moon unit of each grade 0-3. That's four units in all, for a +12000 power boost, and if one of those is Jumping Glenn then we're looking at Ezel-style power gain for a 32000 line. Alternative to this is Sword Magician, Sarah. While the millennium elf has been overshadowing her up to release, Sarah has been catching some hearts now that people have their hands on the new cards. Sarah gets an automatic +3000 when boosted by a Pale Moon, putting Manticore to shame by breaking 21000 with Bicorn, and she falls into the Goku line of cards in that her skills activate when she drive checks a grade 3. When those conditions are met, Sarah soulcharges a grade 3 or greater Pale Moon rearguard, then calls any Pale Moon from her soul. Although the conditions can be somewhat awkward to work with, this effectively lets Sarah stand the unit that she charged, letting Alice have a second go with Deadly Shadow Beast, or working with the new +2000 Midnight Invader rearguard. Sarah can also do this to start up a chain of swap skills, superior calling Purple Trapezist over the rested booster of the soulcharged grade 3's columnt, who then soulcharges Sarah's booster to superior call whatever unit is desired out of the soul to the front line, probably the Alice that Sarah charged, or otherwise pulling in a rearguard Sarah with the vanguard's skill for Trapezist for Crimson Beast Tamer. The possibilities are endless, since you could also call a useful interceptor like Big League Bear (or the slightly hardier Dreamy Fortress) when you're low on shields to guard with for the next turn, or draw cards like Fire Breeze Carrie. Sarah's skills are also always active, letting you accelerate right into the endgame even if you're at just two or three damage. Despite all the talk of the new vanguards, the old Pale Moon hasn't vanished. Dancing Princess of the Night Sky can counterblast 1 both on-call and on-ride to choose a grade 2 or less Pale Moon unit and soulcharge it from the deck. Interestingly, Dancing Princess has caused Barking Manticore's build to grow stronger, not weaker with age. While he cannot reach the same numbers as Luquier, Manticore can consistently get Crimson into the soul with Princess' skill, automatically making Turquoise into something worth the two-card investment and helping Manticore to regularly push 22000 power. Turquoise can even be argued for as getting four slots in the deck with this build, since she can then press any column in the field with a 9000 boost, helping get Dancing Princess or Big League past the 15000 line and making the field in general much more versatile. Someone who wants to run the original Moon will have their work made very easy for them by the new cards, having a much easier time than someone struggling to hit off all of the new skills in succession. Whether the classic look can match the requirements of a modern clan is still uncertain, however. The times have changed considerably since Demonic Lord Invasion's initial Japanese run; 26000 is the new standard now, rather than 21000 being the goal of every deck. In the old days when Dragonic Overlord, Soul Saver Dragon and Amon were the top vanguards, Manticore was the best vanguard that Pale Moon had. With Sarah and Luquier being the trend setters of Rampage, it's going to be interesting to see how the pro scene develops between traditional and modern Moons.